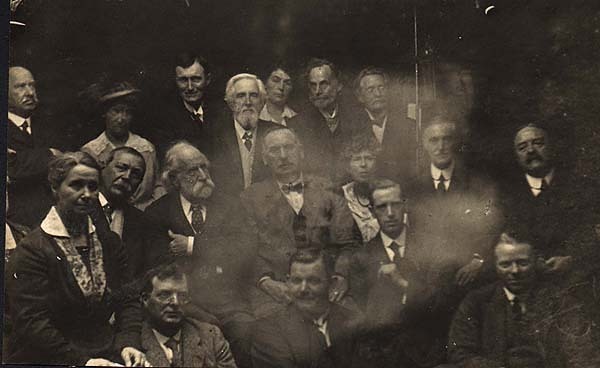 Inscribed on verso: "Annual Meeting of trhe Society for the Study of Supernormal Photography (sic) at the Psychic College Holland Park N.W." The Society for the Study of Supernormal Pictures was established as a rival to the Society for Psychical Research (S.P.R.). The S.P.R. was founded in 1882 by a group of scientists intent on making an organized and systematic inquiry into "the large group of disputed phenomena referred to as mesmerism, psychism, spiritism." The members here present desire to place on record the fact that after many tests and the examination of thousands of pictures, they are unanimously of the opinion that results have been obtained supernormally on sensitive photographic plates under reliable test conditions. At present the members do not undertake to explain how the results have been obtained, but they assert that they have undoubtedly been secured under conditions excluding the possibility of fraud. The most famous member of the S.S.S.P. was its Vice President, Sir Arthur Conan Doyle. Doyle was a physician and the creator of the Sherlock Holmes mysteries. He was also an ardent spiritualist and after 1919 a strong advocate of the spirit photographs produced by William Hope of Crewe. When the Journal of the Society for Psychical Research published investigator Harry Price's expose of Hope in 1922, Conan Doyle responded with a book called The Case for Spirit Photography. Doyle's book sets forth a conspiracy theory for the entrapment of William Hope that Sherlock Holmes would have found anything but "elementary." 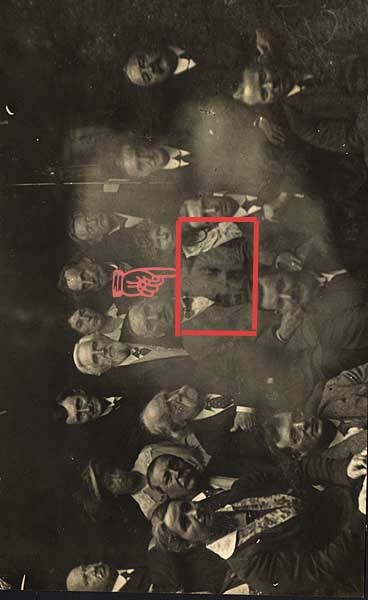 William Hope continued to make spirit photographs, and Doyle succeeded in making him something of a martyr. But Doyle's conspiracy theory and the best efforts of the S.S.S.P. were not enough to counter the unmasking of spirit photographers and physical mediums in general. In 1926, investigator Harry Price would write, "Our photographic mediums are becoming fewer. One after another, they are being exposed. Supernormal photography is the only phenomenon that will not stand up to the 'strict test' of pure scientific research..."
Rolf H. Krauss, Beyond Light and Shadow (Munich: Nazraeli Press, 1995) p. 179. Fred Gettings, Ghosts in Photographs, The Extraordinary Story of Spirit Photography (New York: Harmony Books, 1978) p. 10. Copyright © 2000 The American Photography Museum, Inc. All Rights Reserved. American Museum of Photography and the logo are Service Marks of The American Photography Museum, Inc.